Shells of marine life are growing thinner due high ocean acidity. The only way to slow the process is to reverse the addition of CO2 into our atmosphere. July 2, 2014—-Prior to the industrial revolution, some 200 years ago, the concentration of carbon dioxide (CO2) in the atmosphere was near 280 ppm. Since the start of the industrial revolution more than 500 billion tons of CO2 has been added to the atmosphere. The concentration of CO2 has now reached more than 400 parts per million (ppm). This is the highest it has been in at least the last 800,000 years, or perhaps longer. Carbon dioxide is now being added to the atmosphere in tremendous quantities. We continue to add about 30 billion tons every year and the amount is increasing. The gas in the atmosphere comes from burning wood, coal, natural gas and other fossil fuels. It also comes from the clearing land of trees and other vegetation. Most of our planet is covered by ocean. The ocean absorbs carbon dioxide from the atmosphere at the sea surface. It is then circulated downward by the action of waves and currents. In some areas, the added CO2 is found all the way to the sea floor. The world ocean has absorbed some 30% of all the CO2 that has been placed in the atmosphere since the beginning of the industrial revolution. The ocean is currently absorbing about one million tons of CO2 per hour. The capturing of the CO2 by the ocean has reduced the amount of atmospheric heating that is responsible for global warming. At the same time that the absorption of CO2 reduces the problem of global warming, it causes substantial damage to ocean life. The carbon dioxide dissolves in the ocean to form a weak carbonic acid. This process is acidifying the world’s oceans faster than at any time in the last 300 million years. The acidity is now about 30% higher than it was a couple of hundred years ago. If the present rate of growth in acidity continues, the ocean’s acidity could become double what it was 200 years ago. There does not seem to be any practical means of removing the acidity form the ocean, so it will be with us for the foreseeable future. The acidity of our oceans is threatening ocean life. The effects of the increasing acidity has widespread impact on many marine organisms, from the very smallest to the largest. Carbonic acid dissolves calcium carbonate. Many marine organisms have shells or external skeletons which depend on calcium carbonate to build these structures. Researchers are finding that shelled microorganisms, that form the basis for the marine food chain, are declining. Greater amounts of acidity in the sea prevents the formation of new shells and dissolves existing ones, such as coral. 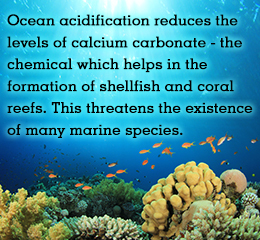 Among the creatures affected by the acidification include oysters, clams, and crabs. The barnacle, which is often found on dock pilings and the hulls of ships, is another example. The negative effects on sea creatures with calcareous shells have already been well documented. Coral reefs are an identifying feature of the tropical oceans. These reefs depend on the growth of small organisms with calcareous shells. 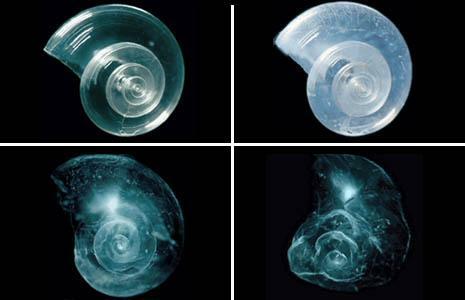 As the sea becomes more acidic, there is less and less carbonate available to form the shells. Some reefs such as the Great Barrier Reef off the Australian coast are already being affected. If our present policies on the use of fossil fuels and continued economic growth persist, coral reefs may begin to break up within the next 40 years. Increased acidification in the ocean, or parts of it, may become too severe to support the microorganisms which are the base of the oceanic food chain. Acidification along parts of the Oregon coast is already so severe that it has cut oyster production in half. The increased acidity stunts the growth of the oyster larvae. Unless acidification is reduced, large areas of the sea floor in shallow water and reefs will be covered with a mat of algae by 2100. There seems to be little chance of halting the process without a major change in policy to slow global warming. In the past there have been times when atmospheric CO2 was higher than it is now. Past changes in the level of carbon dioxide tended to take place fairy slowly. The present rate of increase may simply be too rapid to enable many marine plants and animals to adapt. The only way to slow the process is to reverse the addition of CO2 into the atmosphere. This will take a global response to reduce fossil fuel use. Categories: Climate Change, Disappearing Ice Shelves, Fossil Fuels, Renewable Resources | Tags: Acidity of the oceans, Climate change, Co2 and Global Warming, CO2 in the atmosphere, Renewable Resources | Permalink.